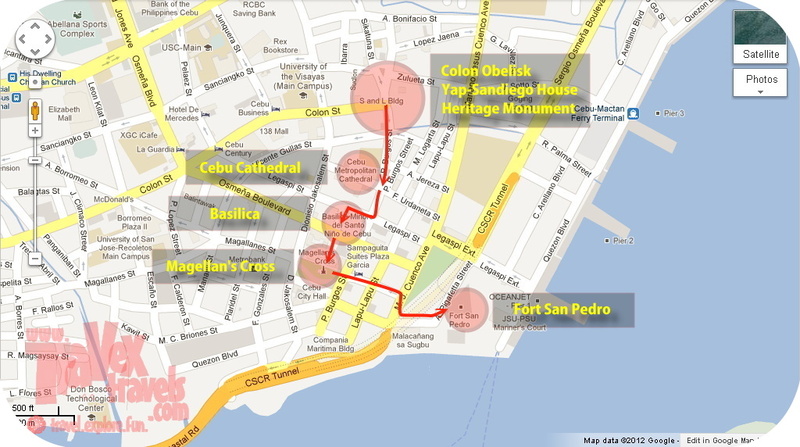 Cebu City map featuring Cebu tourist spots like Magellan's Cross, Cathedral and the Fort. 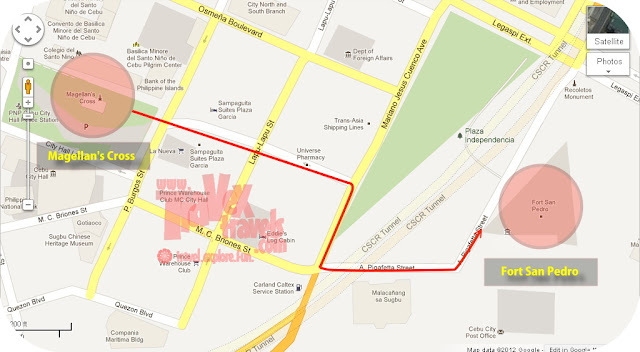 From Colon Obelisk (how to go to Colon here), you can actually reach Cebu Cathedral in a few minutes (Mabini Rd). From Cebu Cathedral, walk your way from Legazpi St. to Zamora St., one block away from the church. Just walk straight until you see the Basilica del Sto. Nino. 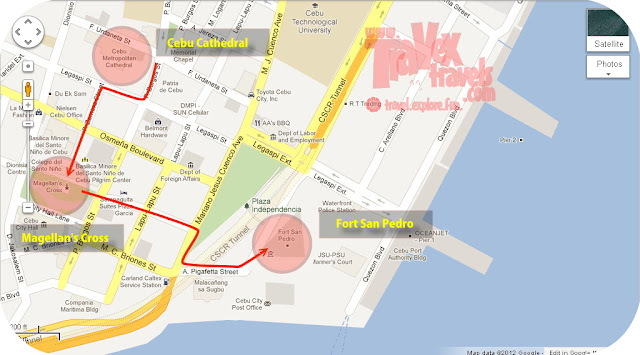 The Basilica is just a few meters away from the chapel where the Magellan’s Cross is located. Walk it. 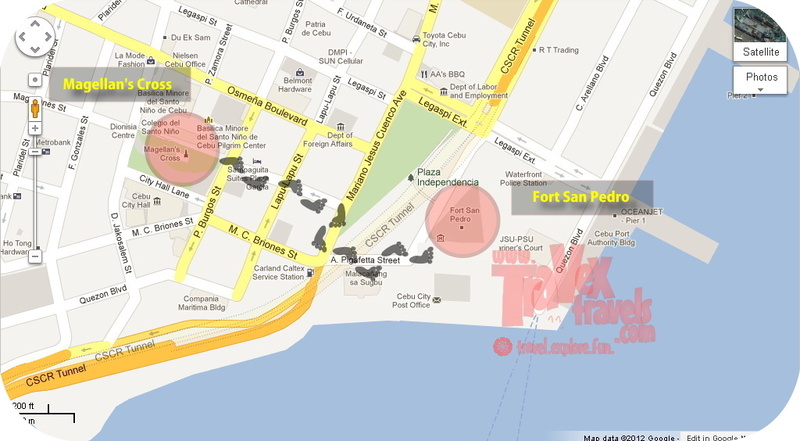 Fort San Pedro is quite somehow walking distance from Magellan's Cross, Cebu City. From Magellan’s Cross, facing the entrance to the Magellan’s Cross or the city hall (away from the Basilica), turn left and walk (you will be passing by the side of the Islands Souvenir and Sampaguita Suites). When you reach the highway already, the park just in front is the Plaza Independencia. You can turn right and follow the path which will lead you to Malacanang sa Sugbo and walk straight and get inside the Plaza Independencia. Fort San Pedro is the structure somewhere at the back of the plaza. 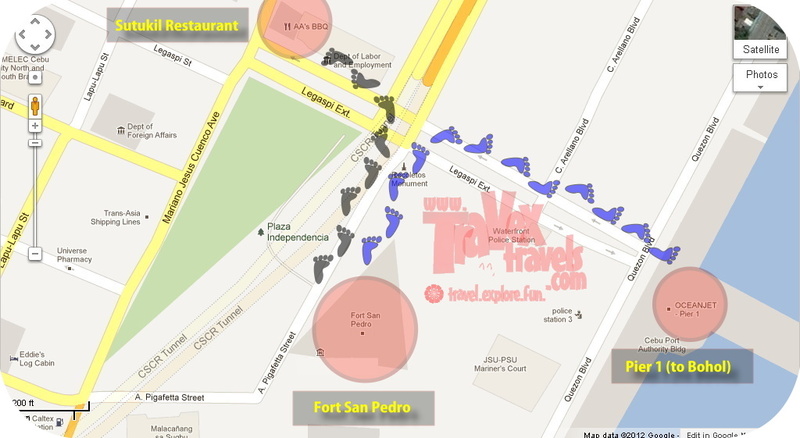 Fort San Pedro is also near from AA Sutukil and Pier One (Oceanjet). *If you want to eat in nearby restaurant, AA Sutukil Restaurant is a walking distance from the Fort. If you plan to visit Bohol too, Fort San Pedro is also near the Pier 1 (Oceanjet). Going to Cebu City tourist spots like Magellan’s Cross and Fort San Pedro is easy because the city tourist attractions and historical landmarks are quite near from each other. Go and visit these Cebu City tourist landmarks!